In 1977, the Govt. 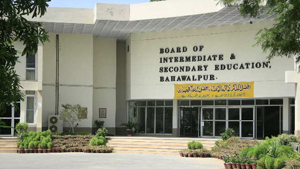 of the Punjab separated the Bahawalpur Division from the Multan and approved the sanction of B.I.S.E Bahawalpur as a separate independent Educational Board. On 9th July 1977, a camp office of Bahawalpur Board was established in Multan and the willingness of the staff of Multan Board for Bahawalpur Board was called for. On 3rd February 1978, the Bahawalpur Board started functioning in Bahawalpur in a hired building and at the middle of 1978, on the completion of staff, the first examination of Supplementary 1978 was held. In early 1979, the office of Bahawalpur Board was shifted to a building of Daulat Khana afterwards; the Revenue Board allotted about 23 Acre plot of land (wherein the present campus exists) to Bahawalpur Board. The Board, according to its financial means built the boundary wall and a limited office building, and the Board was shifted to this campus in 1985. With the increasing number of candidates and requirements, it was decided to build a new building for the Board in 1989. The construction of the new building was started in September 1991 and it was completed in 18 months with the cost of about 2.5 corer rupees. The office of Board was shifted to the newly constructed building in March 1993 and the old Building was specified for Sports Hostel Warehouse and Secrecy Offices. Now it has been decided that this old building will be specified for Examination center. Thanks to God that the new Campus is not only spacious enough for different branches of the Board but it also includes a magnificent Auditorium, a grand Masjid and separate buildings for Bank and post office. Moreover, there are 36 fully furnished residential quarters for staff members of the Board.